An accessory I love is a statement necklace. I feel they are sometimes necessary for making an outfit complete, which is why I'm loving statement sweaters right now! Statement sweaters, at least that's what I call them, are basically sweaters with a jeweled neckline. You wouldn't need to wear a statement necklace with them because they are so gorgeous and stand out on their own. This is one that I picked up from J.Crew, and styled it with my favorite oxford button down from Kiel James Patrick. Here are a few others that I'm crazy about! What statement sweaters are you loving? Be sure to enter the current giveaway for your chance to win a fresh pair of Classic Jack Rogers Navajos! Love the Sweaters, Rachel! Especially the #4, Tory Burch Lucy Sweater! 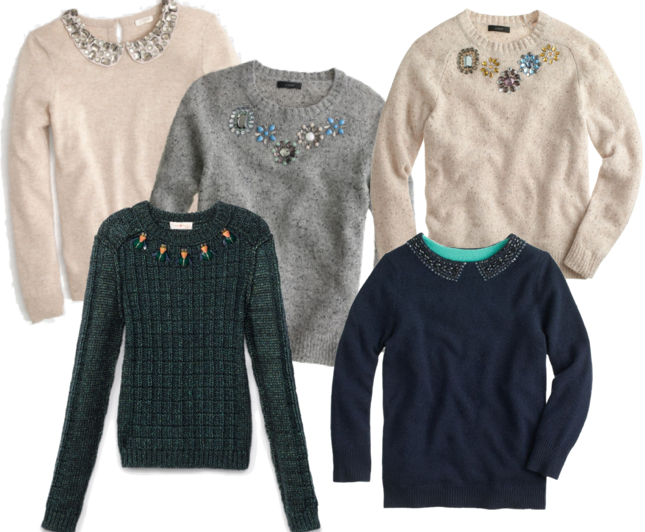 All of these classic sweaters with the flair of the jewels will never go out of style! Those are some really nice sweaters! !